This is a watercolour painting of Jack who gets much more attention from everyone than I do. He's definitely King of the Castle around here. My status as the spoilt brat has taken a bruising. The painting's for Lynnes birthday on 16 August. She's getting it now otherwise I'll forget. View from Rue du General Tartas. Now you may think I look like I've got a hangover, but I'll have you know that's just what I look like these days. Fourth time visitors, in fact. Thijs and Jose at La Petite Galerie. Thijs is a passionate walker (I'd like to say obsessive, but he's the shrink, not me). He's walked to Compostela many times and from most directions. While he was editing and proofing his book (one of several) on psychology, Jose and I were in the French countryside painting en plain air. Thijs is also a wonderful cook and they gave us a great meal in the garden. But then is was time to say, Totsiens julle. And we hope to see you at La Petite Galerie again one day. IT'S MIDSUMMER AND IT'S HOT! It's over 30 degrees. And we're in the Pyrenees. With hundreds of thousands of other spectators. From all over the world. And from France where we’ve lived for 18 years. At La Petite Galerie. We're parked at the side of the road. Where we've spent the night. And we're waiting for something to happen. It's the peleton in the 100th Tour De France. 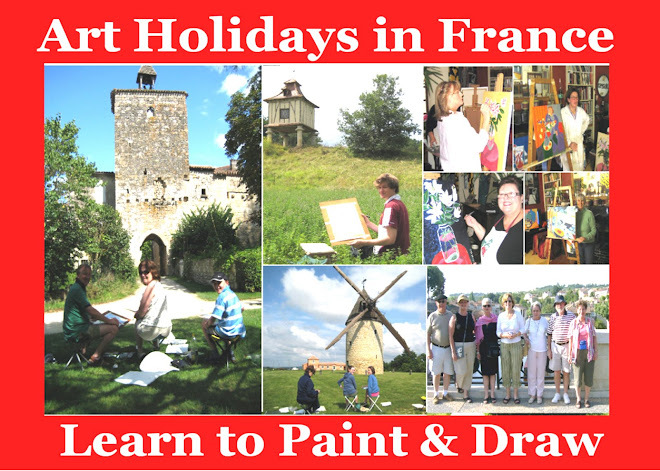 All the way from Brisbane in Australia, Hayley, Meredith and Rob working on a watercolour painting in Fources, 'un des plus beaux villages de France'. 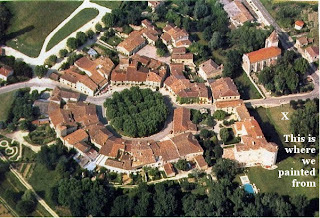 Fources in the Gers is a rare round bastide village, meaning a fortified town built in the middle ages, when the whole area belonged to the English. Just as we were finishing a plane flew over and took a shot of us. If you look hard you can just see us sitting under the trees where X marks the spot.